You won't believe how easy it is to create this beautiful and festive vanilla flavored Christmas Swirl Bundt Cake! Place dry bundt pan in the freezer for at least 2 hours. In the bowl of a stand mixer or a large mixing bowl, beat butter until it lightens in color and is fluffy, approximately 5 minutes. Meanwhile, sift together flour through salt, set aside. In another bowl, whisk together milk, clear vanilla extract and egg whites. Alternate adding dry flour mixture and egg white mixture to butter until fully incorporated and then for 1 minute longer. Measure 1 1/4 cup batter into a separate bowl and mix well with red liquid gel food coloring, approximately 1/2 teaspoon. The amount will vary greatly depending on brand, so add as much as you need to reach a red tone. Remember that the color will intensify while baking. Transfer red cake batter into a large piping bag, twist the top to secure and place in the freezer. Repeat the same process with green liquid gel food coloring. Place remaining white cake batter into the refrigerator until ready to use. In about 30 minutes, preheat oven to 350 degrees. Remove bundt pan and batters from the freezer and refrigerator. Spray bundt pan liberally with cooking spray. Pipe red cake batter into alternating swirls of bundt pan, using a skewer to nudge batter into crevices. Don't be overly concerned with where they meet, as this will be covered by frosting. Repeat with green. The bundt pan has an equal number of swirls, so you will have two swirls next to each other that are the same. I know, OCD folks are going to be going nuts! You can use Olivia's step-by-step photo tutorial as your guide. Very carefully spoon remaining white batter directly into the center, making sure you don't mess up the piping on the sides. The white will creep up during baking, so don't worry that it is not all the way filled. 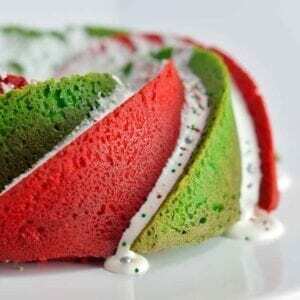 Pipe the remaining red and green batter into the top of the white and then lightly swirl with a skewer. Bake for for approximately 60 minutes, or until you can inset a skewer into the center and it comes out clean. Allow to cool for 15- 20 minutes. Tap on the counter to loosen and then invert onto a cooling rack, FLIP it, pray everything loosened and then remove the bundt pan. Allow to cool fully and then trim the bottom to allow the cake to sit evenly. Make Marshmallow Fluff Frosting and pouring over crevices. Finish with holiday sprinkles. Take photos, post them on Facebook and wait for all of your friends to comment on your beautiful, amazing cake! Make sure you use a CLEAR vanilla, otherwise it will tint the cake batter.